In a world of inherent divisiveness, where anyone can make a case against anyone else, however tenuous, Leo Messi stands alone as perhaps the most universally likeable athlete in the world, the one most beyond objective reproach. Even the formerly unimpeachable Steph Curry began to rub people the wrong way toward the end of the NBA season and into the playoffs, though that probably had more to do with the people around him and necessarily opaque injury concerns than anything else. Defending Messi’s performance with the Argentine national team comes with two implicit conditions: the first, much more palpable, is that he contributes as much to his success at FC Barcelona as the rotating cast of world-class midfielders and strikers the club places around him. Perhaps increasingly dubious, the second is the recognition that Argentina is a team capable of winning the World Cup, or a lesser competition such as the Copa, thus raising expectation above the bar of, say, Gareth Bale for Wales, or even eternal foil Cristiano Ronaldo for Portugal. Argentina’s run to the 2014 World Cup Final proved that the team is, or was, capable of standing toe-to-toe with the world’s foremost footballing nations. Only a goal from Mario Götze in extra time separated Germany from Argentina then. Back-to-back Copa campaigns ending in a final on penalties, with Chile on the other side, barely separates those two nations at all. Messi’s penalty miss was the first in a shootout of his career, but all the moments leading up to it point to the fact that the match should never have gotten to that point in the first place. All of which, as always, brings us back to Messi himself, who has always had an uncomfortable relationship with his home nation. Leaving Rosario, his hometown, at the age of 13 in 2000 by way of a napkin contract with FC Barcelona gave little Leo the chance to, if he wanted, play for Spain. Though we didn’t know it at the time, had he done that, the conversation around him may very well have been an inflated version of what he faced with his club team during the height of tiki-taka and Spain’s international dominance, the gist of which being something in the vein of nature vs. nurture: Messi is a brilliant, uncompromisingly dominant player, but he is surrounded by teammates (Xavi Hernández, Andrés Iniesta and the like) who make his job that much easier. So taking up with Argentina was the greater challenge, the disruption of comfort. Following his first loss in a major international final, at the 2007 Copa to Brazil, Messi had to watch as his teammates and La Liga competitors won three consecutive major trophies, the 2008 and 2012 Euros as well as, of course, the 2010 FIFA World Cup. Argentina hasn’t won a major title since 1993, and the shadow of Maradona has followed Messi throughout his career as a result. And yet, so often, Argentina has failed its native son. There is no innocence in soccer – it seems unlikely there ever has been – but Argentina has an especially vile history with the sport, as rampant hooliganism stemming into gang violence and pervasive corruption have both helped dictate soccer’s direction in the country. Neither of these is unique, as FIFA’s increasingly public struggles and any surface study of England in the 1980s will tell you, but they don’t coalesce to create a hospitable atmosphere for engendering growth and community at any level, let alone within the world’s most popular sport. The Copa final was another referendum on Messi’s jaw-dropping talent, and another chance for people to prop him up against Maradona and Pelé. Just how good can this chap really be if all he does is lead his country to repeated finals, only to lose? 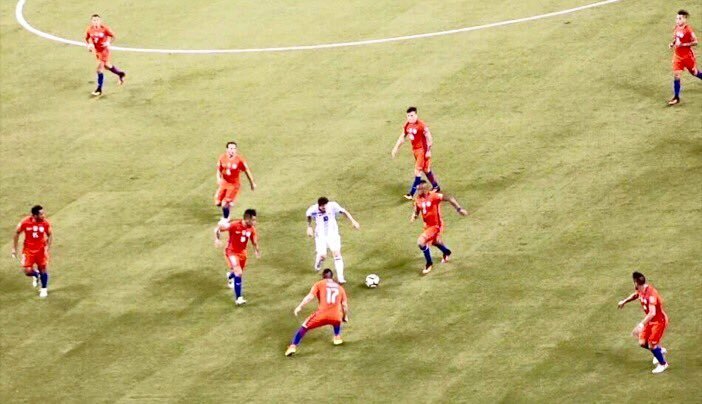 Chile rendered him largely ineffective because, at any given moment, it would have up to four or five of its players focused on him defensively, as it is seemingly the only way to stop him. While this opened up fleeting opportunities for his teammates, Chile nevertheless largely negated the impact of the player most responsible for its opponent’s presence in the final. In the wake of the Copa loss and Messi’s announcement, seven other Argentinians have threatened to quit the national team. None of them will receive the backlash Messi has, but by the same token, none of them has yet received a statue from the mayor of Buenos Aires as a form of goodwill and bridge-mending. A statue should be the least of the country’s concerns, soccer or otherwise, especially for someone as publicly ego-resistant as Messi, but it is still a sign that it needs its best player, something of which it has seemed unsure in the past. As Messi goes, so goes Argentina. It would not be terribly surprising to see Leo start waving his immense power at the Association, not unlike LeBron James does with his influence on the Cleveland Cavaliers. 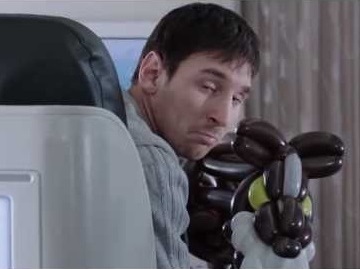 Only if Argentina makes changes Messi deems necessary – such as, oh, making proper travel arrangements – does it become fair to blame him for their continued shortcomings, particularly with only the 2018 World Cup and 2019 Copa projecting as still being within Messi’s prime, as far as major international tournaments go. It’s a high price to pay, certainly, but one worth paying to eradicate demons. Just ask LeBron. The mouthpiece-throwing incident notwithstanding, of course. Somewhere, someone made this observation in the immediate aftermath of the Copa Final, but I can’t remember who or where. Feel free to correct me/bring it to my attention if you see it, and apologies to that human being for now. What Gonzalo Higuaín did, or failed to do, on his breakaway in the first half should be a punishable offense under the Geneva Conventions. He doesn’t deserve the Falkland Islands. Take, for instance, an AFA presidential vote among 75 members which ended in a 38-38 draw in December 2015. Neither of whom, to the best of my knowledge, ever won a major tournament playing 1-on-11, or even 1-on-10, though Maradona came considerably closer at the ’86 World Cup than Pelé ever did. Related: 1986 is not 2016.